A Crypto Currency Boom is fuelling a new startup financing market - But can it help Save The News? So How Then Is PressCoin Going to Change any of this? A primer on Scoop’s "ethical Paywall"
For the past couple of weeks I’ve been working behind the scenes getting to know the team behind Presscoin.com, the latest participant in the remarkable Initial Coin Offering (ICO) boom which is rocking financial markets around the world, and which may well herald an inflection point in the history of money. 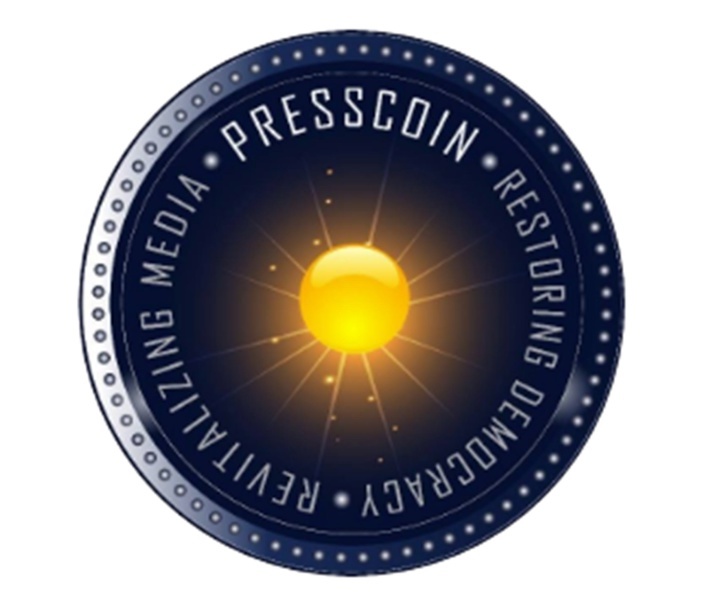 Scoop Co-editor Joseph Cederwall brought PressCoin to my attention initially. And after exploring the PressCoin website and reading the white-paper, my initial impression of PressCoin – just three weeks ago- was one of admiration for the audaciousness of their plans, mixed with a healthy dose of skepticism. As I dug deeper, and got to know the crew, I embarked on a fairly steep learning curve. To understand their plans I needed to better understand the blockchain itself (which can perhaps be most easily thought of in the case of PressCoin as trust mediation technology which can be used to facilitate cooperation) as well as the extraordinary boom in Crypto Currencies (1500% growth over the past 12 months). One of the things I quickly stumbled upon is the fact that it is in all likelihood the ICO Boom which started in earnest in July this year – that has been driving the explosion in the broader Crypto Currency market - and most spectacularly and the value of Bitcoin (BTC) the oldest and, for now, most valuable crypto-currency in the market. The report that follows (Part one of a two part series) outlines what I have discovered in my inquiries, about PressCoin and its plans and the people and businesses behind it. 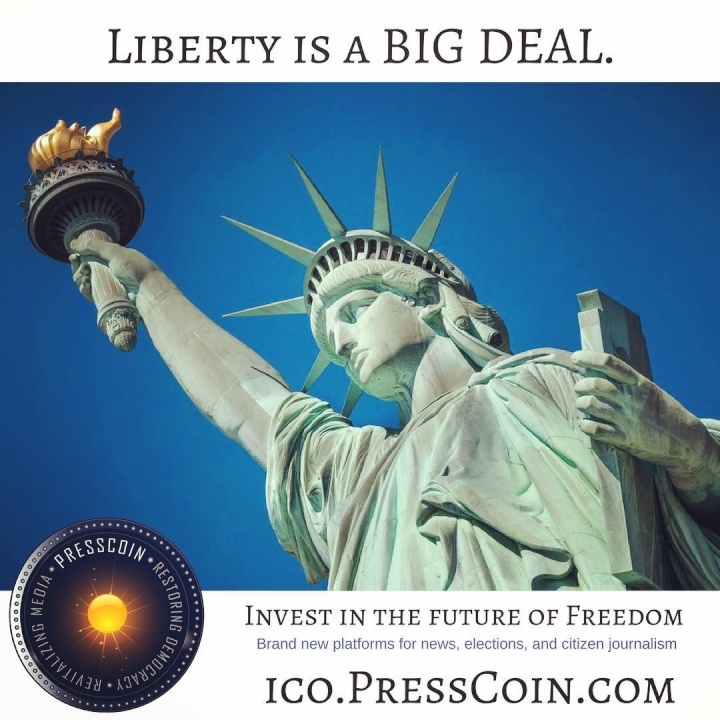 It also provides some context around recent developments in the #FutureOfNews debate, to assist those who might consider investing in PressCoin to better understand the business processes the PressCoin project is hoping to address and disrupt. And I conclude by talking briefly about why I decided to join the team working on the project. 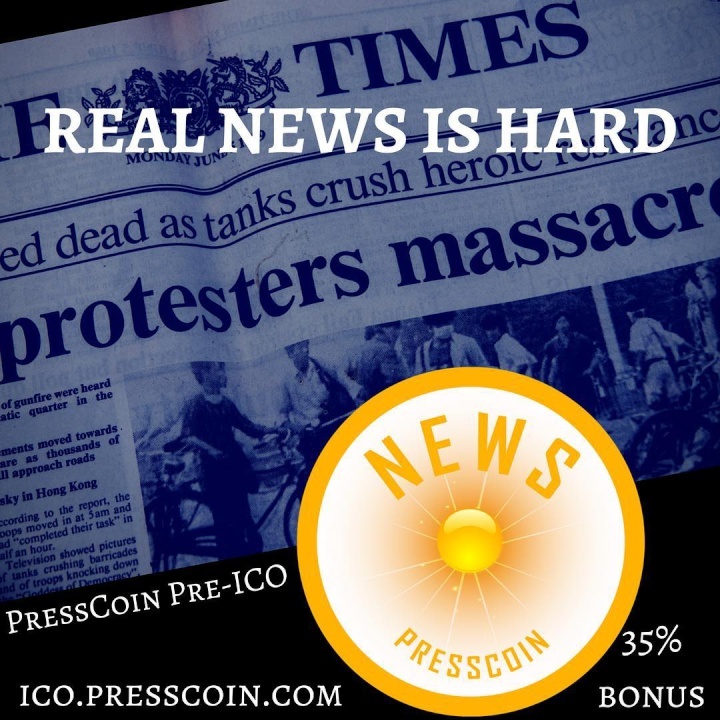 My Conclusion: The PressCoin ICO is certainly worth consideration, and if you are interested in the future of news like I am probably worth investing a few dollars in. Hence my deciding to join the effort to help it succeed. From what I can see most ICOs tend to be based around traditional disruptive high risk technology plans – companies hoping to be disruptive, to achieve exponential growth, and which aspire to join the ranks of the unicorns - or failing that be bought out by one of them. PressCoin by contrast is at its heart a collaborative play, a venture which plans to build its future around assisting an existing industry to better chart its path through troubled waters in a cooperative manner. And in a sense therefore it is a blockchain venture that plays directly to the promise inherent in this remarkable new technology - and indeed into the promise that the internet showed in its early days. Of course like everything at the bleeding edge of this technological maelstrom, it is a high risk investment. But at the same time it has - in my view a more credible plan than most, the possibility of systemic change - albeit a remote one, plus a great spirit. And consequently I have become a supporter and joined the team. 20 years after I started working in the online news business back in 1997, it has become blindingly obvious in the past four years that an industry which looked to have such a bright future back in 1990s is now fundamentally broken. And it’s not simply a question of Facebook and Google eating the old media world’s lunch. The way the traditional news industry has responded to the threat has also been fundamentally mal-adaptive. The consolidated media giants have been for the most part closed-minded, combative and competitive. The industry has rejected opportunities to join forces and form industry responses to the challenge – and continues to ignore innovative ideas even when they presented to them on a plate. Back in 1997, when a group of four Kiwis (Peter Fowler, Ian Llewellyn, Andrew McNaughton and myself) launched NewsRoom.co.nz immediately after the first MMP (proportional representation) election in NZ of 1996, we had hopes for a bright future for our venture. It was only a short time after the World Wide Web and its foundational language HTML had been invented by Tim Berners-Lee. 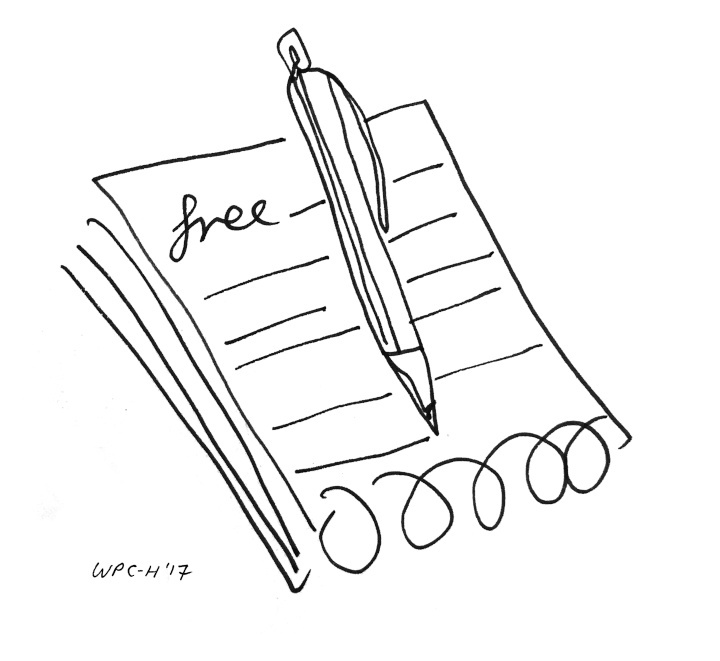 The prospect of being able to publish at very low cost to a worldwide readership looked certain to herald a new golden age of news publishing. And in political and readership terms the promise of our new form of up-to-the-minute internet publishing was immediately realised. NewsRoom, like Scoop.co.nz, digitised the in-box of NZ’s Parliament, and revolutionised the manner in which political parties talked to each other, the media and the public. Within a few short months the quality of material being produced by the participants in the democratic process had dramatically improved and we had become an invaluable part of NZ’s political nervous system. 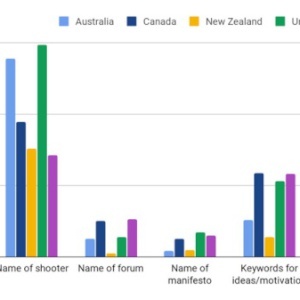 By providing participants in the political process - especially the smaller and less powerful ones - with the ability to flag to the world their views on what ought to be done, I think we helped facilitate the massive improvement in NZ’s Parliamentary process that arrived with MMP. Within months of our launch we would often see political parties trading releases about particular issues over the course of a day. In the past such discussion would have taken several days to work its way through, as the news cycle worked on a daily or perhaps twice daily update cycle at best. But while we disrupted - and we think improved politics - we quickly found that translating this into revenue was also difficult. NewsRoom’s main initial source of revenue was a contract to provide a news service to one of NZ’s first ISPs, ClearNet, which was later merged into TelstraClear. And when this contract was lost, the loss of revenue precipitated the fall of Newsroom 1.0. Scoop.co.nz arose out of that early foretaste of the precariousness of digital publishing. 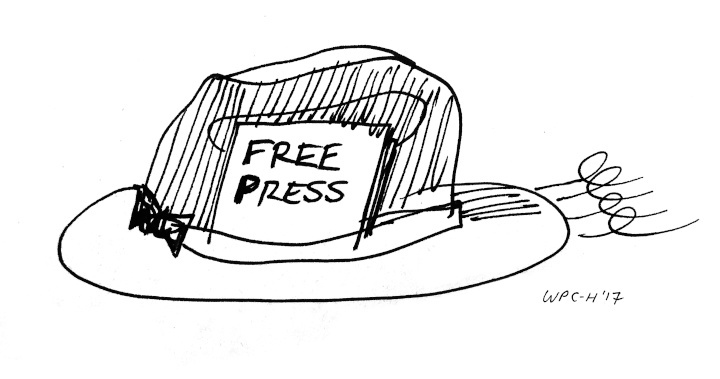 And in the years since, I have had the benefit of a ring-side view of the ever accelerating cycles of disruption of the old-order of journalism and news publishing. The rise of blogging and forums, the empowerment of angry "commenting" personalities set free by anonymity to express their malice, market-eating algorithmic marketing systems, the invention of the smart-phone, the rise and rise of "the platforms", and most recently the commercialisation of fake news, the segregation of points of view on Facebook (and creation of echo-chambers) and the weaponisation of news information delivery systems to attack democracy - as seen in Fake News epidemic that took place during the US 2016 presidential election. Today as we approach the end of 2017, seven election cycles later in NZ, I can only see a very bleak future for the so-called Fourth Estate. While journalism is a things which everybody seems to acknowledge as a vital component of our democratic systems, our economic and political system appears to be unable or unwilling to support it. Confidence in the news industry both internally - among journalists and publishers - and externally, by readers, is at an all time low. The endless cycles of journalist headcount cutting which began in the 1990s continues at pace. The ubiquity of complete nonsense and click-bait masquerading as news is painful to experience. Meanwhile the pace of technological innovation in marketing and news delivery systems continues to accelerate, making it impossible for small independent publishers to join the game – no matter how talented they are – unless they wish to do for several years as a hobby – happen to know a millionaire - or are willing to stake their house of the gamble that they might be able to achieve what nobody else has been able to. These days globally only the very biggest of the biggest are even close to breaking even in their digital publishing divisions. Using a combination of advertising and paywall/membership revenues – global reach and viral content delivery channels, the New York Times, Washington Post, Guardian and Daily Mail are the leaders amongst a handful of publications making a go of commercialising news in the online space. But the reality is that all four of those publications is also propped by old-school industrial news business models, namely print advertising and cover price revenue. And all of them also started this cycle of destruction with deep reservoirs of cash reserves - most of which are now gone. There’s also a bit of irony in the fact that the three quality journalism publishers among this group are arguably doing better right now, precisely because they have - in a sense failed in their role of informing society? The twin trans-Atlantic democratic debacles, Brexit and Trump, have been a great boon for quality news media membership models (like the Guardian’s), and a fillip to paywall subscription sales at the NYT and Washington Post. In the event that these crises are at some point resolved, public subscription and membership revenue for all three of these publications may well start to fall again. Meanwhile for the new generation of digital publishers, Vox, Axios, Buzzfeed, Mashable, The Intercept and Vice, the news is also not so good – even though they are definitely doing great high quality journalistic work they are beginning to hit a ceiling, after having barely taken off. After a fairly brief flirtation by venture capital firms with new media companies in 2015 and 2016, the interest of the disrupters in the media fizzled out around the time Gawker media was killed off by Peter Thiel and Hulk Hogan. Two years on their valuations are falling and revenue targets are being reset, downwards. Buzzfeed in particular has discovered the sponsored editorial model doesn’t scale well –it turns out becoming a digital agency in this day and age can be a relatively low margin high maintenance business. The possible exception to this is Politico, a publication which like Scoop.co.nz reports on the core democratic processes - so far in the US and the EU. Politico’s highly valued news intelligence output has secured it a special place among partially paywalled websites, distinguishing itself from other paywalled sites which serve a deep pocketed elite with the information they require to function such as the The Financial Times, The Wall Street Journal, and Bloomberg news. None of all this has been much of a surprise to me. Over the decade since 2017 the direction of the "attention market" – wherein publishers decided they were in the business of selling the eyeballs of their readers - has been steady and remorseless - disrupting both the advertising and news industries in an equally inexorable fashion. As technical solutions to the challenges of servicing e-commerce businesses, i.e. finding the right targeted audience were solved, the vast bulk of advertising inventory became nearly worthless. Here in New Zealand, while the recent, and rather spectacular success of the Jennings/Murphy/Hickey NewsRoom.co.nz re-launch, and the rise and rise of TheSpinoff.co.nz are certainly bright spots in the history of digital media in NZ, their success is being achieved against the flow of the market, and will be hard to maintain. In the end their futures will be decided by a group of perennially fickle corporate marketing managers, who will be constantly advised by their agencies that there are higher ROI [Return on Investment] options to help them deliver bottom line performance in selling widgets or whatever else they’re buying advertising to achieve. Call me a cynic - and I hope I am wrong about this- but my experience strongly suggests that corporate organisations struggle to understand the value of association with excellence in content, no matter how well it is presented to them. These days, news just seems so ubiquitous, so commodified. As consumers of information it almost seems oppressive at times. 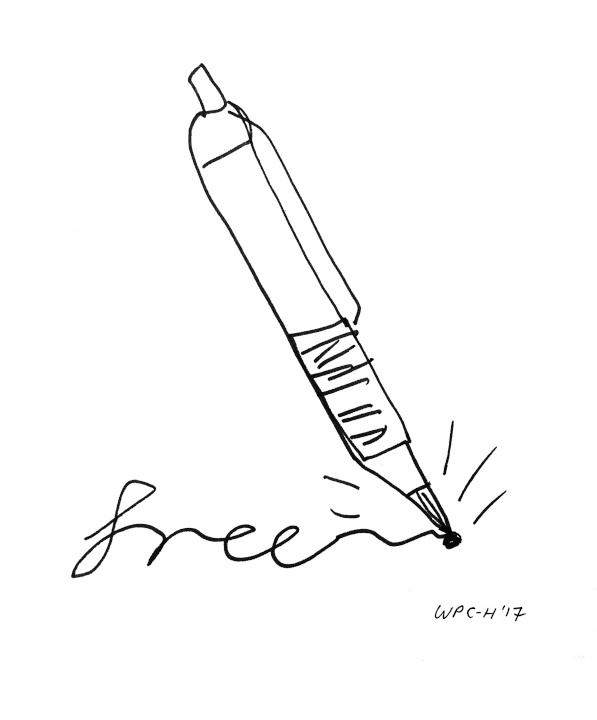 And this is so in part because there is no concerted effort by the news industry to sell itself, to convince their advertising clients, corporations who rely on the success of democratic institutions and the rule of law, that the news industry is nothing more than a carrier signal for marketing messages. Perhaps realising they are stuffed, Stuff (Formerly Fairfax) appears to have decided to continue its diversification strategy expanding its foray into the fibre-broadband market and the online video entertainment space. This was my question when Scoop co-editor Joseph Cederwall sent me a link to the ambitious USD$100 million ICO plan a couple of weeks ago. If the news market is so screwed, what could possibly make a difference? Joseph lined up a call with Amit Rathore, the erstwhile leader of the PressCoin project, to explore the possibility of a collaboration between PressCoin and Scoop. Our Skype discussion - NZ/US/France - started with a brief explanation of Scoop.co.nz and its raw-news aggregation and ScoopPro business models. Amit listened with interest and then explained his background as a founder of Quintype, a high-tech cloud based publishing platform provider which simplifies the deployment of state of the art news publishing systems. We quickly established that Quintype may well be a good fit for the next stage of Scoop’s development. Amit then explained that PressCoin’s vision of a way to fix the future of news was to grow a 100 million strong network of thinking and discerning readers to support a decentralised, platform based news eco-system that would serve the news needs of people who care about fate of the planet and democracy. So far so good, but like a lot of people I was wondering how exactly this would work. How would this USD$100 million investment kick off this systemic change? Amit was certainly saying all the right things when it came to defining the problem. But that has always been the easy part. My initial feeling was that on the solution side the story PressCoin was telling was still a bit fuzzy. Nevertheless I was open to being convinced, and our discussion continued over the next few days. The core business-model for PressCoin in its early stages will be Software As A Service (SaaS) subscription revenues paid by independent publishers for use of PressCoin built, shared, scalable, state of the art (data driven) publishing system. Systems which Amit is confident can be provided at a fraction of the cost publishers routinely pay when trying to build such systems via the traditional digital agency/developer model. These services will be provided on top of the AWS (Amazon Web Services) news publisher developer-kit which Amit had previously built at Quintype. The company is now servicing a variety of different clients and serving 120 million pages of content a month. Perhaps most notable among these clients is The Quint, an Indian Huffington Post like publication in English. Fortune and Bloomberg also have deployed Quintype-powered publications. Having spent years trying to keep up with the technology requirements in the industry, and failing, this part of the pitch made perfect business sense to me as a publisher. And this shared data-driven technology platform approach immediately reminded me of Scandinavian news publisher Schibsted Group’s call in 2016 for the formation of a global alliance among news publishers. In June 2016 , The Tinius Trust – which owns half of the Schibsted Group (Scandinavia’s largest newspaper publisher – and the owner of a large number of online classified market sites in the EU) – had assembled a cast of news luminaries including legendary Guardian Editor Alan Rusbridger to introduce their ideas. They published a wonderful report dissecting both the ailments of the news industry, and proposing a solution. Schibsted’s plan was to build a state of the art data-first publishing platform to personalise the news services provided to readers who would be, by virtue of the benefits of doing so, be encouraged to login to use the fully featured product. This would make news services functionally more like Facebook, and thereby give the news industry sufficient scale sufficiently to directly compete with Facebook and Google in advertising markets. But Schibsted quickly discovered that asking News Companies to work together is a bit like trying to train cats to hunt mice together. The Tinius Trust’s call for a global media alliance wasn’t even reported on in Alan Rusbridger’s own newspaper. PressCoin’s plans are more fluid than Schibsted’s but broadly similar, and focussed on a different tier in the publisher world. 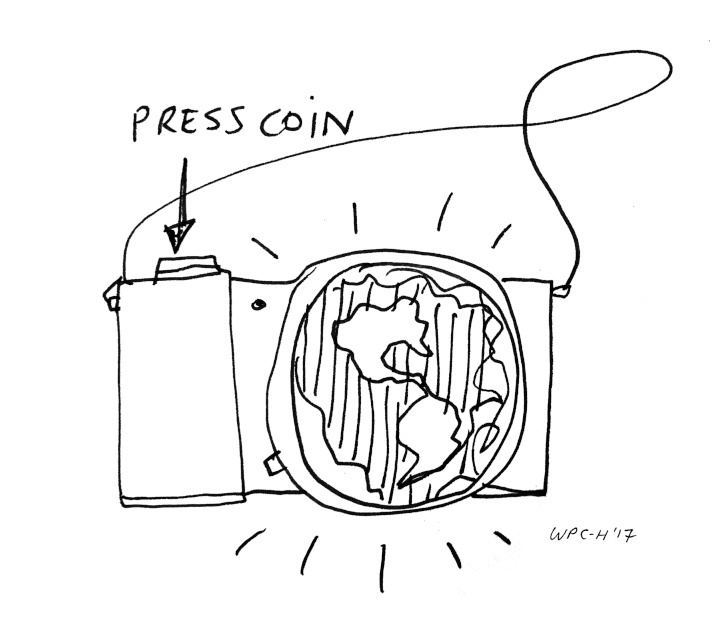 PressCoin hopes to help network the new and emerging publishers of the world keep up with the pace of change. And while USD$100 million will only get you so far in developing such technology, using development teams based in India ought to make this sum of money go at least five times as far as it might go if invested in tech teams based in Stockholm. 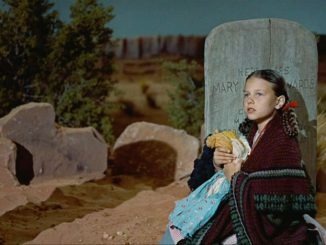 However for me there remained a key unsolved challenge in this story. In a market where revenue yields on advertising have been on a steady downward path for a decade – crippling every new entrant to the game before they even get started – SaaS revenue from publishers might also be difficult to grow, unless PressCoin was able to also bring to bear some other innovations to tilt the playing field in their direction. 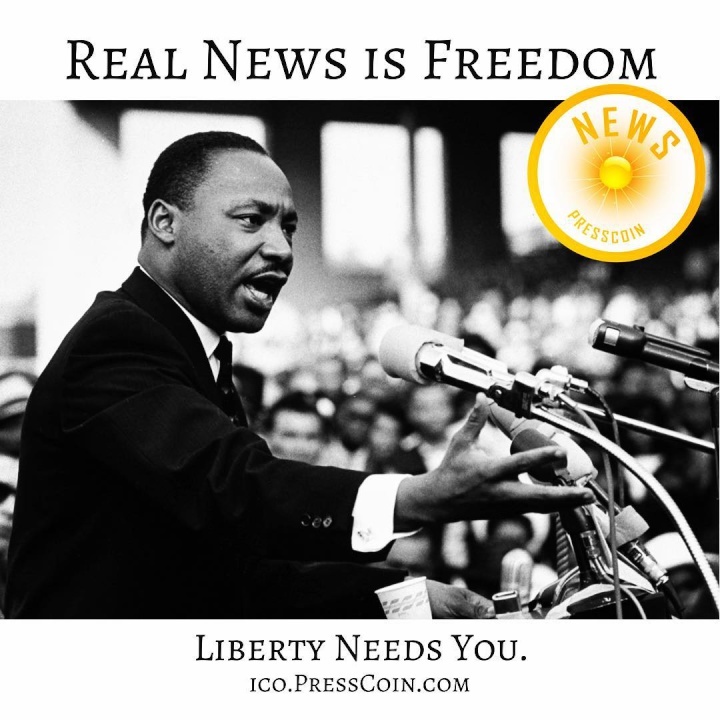 If lowering the costs of news publishers by using shared digital infrastructure is leg one of the PressCoin vision, leg two involves enlisting the assistance of engaged readers to improve the quality of the product – and to help the network grow. This idea also rang a few bells. 2. Dutch crowd-funded start-up De-Correspondent – which is set to launch soon in New York with what can be expected to be a fire-cracker crowd-funding campaign. WikiTribune, which is presently operational in Beta – built on a modified WordPress platform, is providing its readers with the ability to participate in news creation by contributing articles, proposing ideas, and suggesting edits, additions and corrections to articles on the site. Article production is supervised by a staff of paid editors and journalists. It’s early days so far, but it is definitely an exciting project (which you can join here if you want to have a look inside the kitchen). WikiTribune, like Wikipedia, presently has a reader donation funding model and the project already has a fairly large number of supporters who have committed to recurring monthly funding. 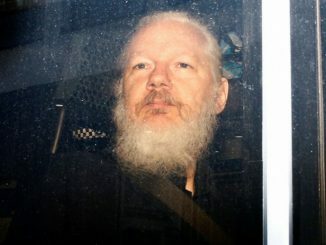 This is the same business model which is powering De-Correspondent and Jeremy Scahill’s Intercepted podcast (on The Intercept, First Look Media’s investigative journalism powerhouse led by Glenn Greenwald, Jeremy Scahill and Laura Poitras and funded by billionaire Ebay founder Pierre Omidyar. For its part De-Correspondent is a reporter’s dream, a publisher built by writers for readers who value quality thoughtful content from subject specialist reporters. Their model is also reader funded, and includes baked in opportunities for informed readers to help shape the news agenda via facilitated engagements with reporters and newsletters. There is much more to its very well thought out approach that can be explored here. Given that PressCoin is a crypto-currency based project, it is unsurprising that Amit’s vision for facilitating reader assistance is blockchain based. Amit’s plan is to provide for blockchain tools to be integrated into publishing platforms to reward engaged readers for their "mid-funnel" assistance with the news publishing and distribution process. This could range from submitting stories, and tips, to fact-checking, collecting source material from the scene of a news event, and sharing material on Social media. Rewards would be securely and transparently tracked using the Blockchain and delivered in the form of PressCoin tokens. While I have some skepticism about how well monetary incentives work in such circumstances, I can see very clear value in a cross publisher karma system to enable engaged and clever readers to move about a news universe and assist publishers in subjects they are expert in. In addition, paying for assistance in crypto-currency is all very well, but will the PressCoin tokens be worth anything? 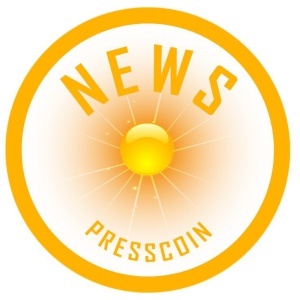 The facility of PressCoin for the purpose of making a new market for news will be backed up by provision of a real-money/PressCoin gateway via an associated project which lends quite a lot of credibility to the PressCoin project. CointypeX is a brand new Cryptocurrency exchange with an integrated Swiss Bank, featuring super-low transaction fees on transfers, payments and even fiat foreign exchange. CointypeX was built by a team of Wall St. technologists with experience in high-frequency trading, and investors in PressCoin are being encouraged to open up their crypto wallets inside this new exchange. 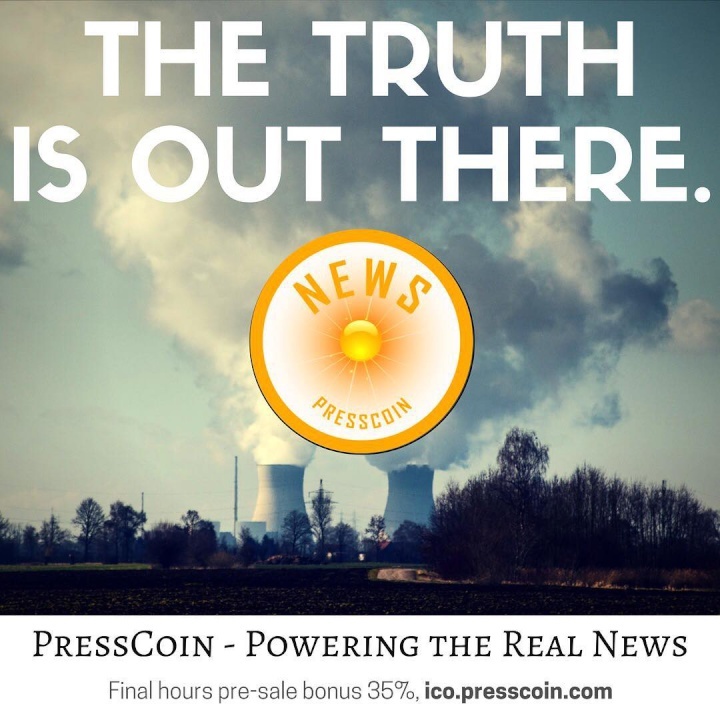 In addition, PressCoin’s NEWS tokens are backed with share in ownership of the PressCoin platform company itself – PressCoin PLC - which makes it entirely different than most of the new ICOs presently being issued, some of which have no real asset lying behind them at all. By providing an external market to price PressCoin, and encouraging PressCoin transactions within its eco-system, it should be possible for PressCoin network publishers and technology providers to start trading internally to build network connections – for example by building a web-traffic exchange to direct readers to related websites and content - and to pay writers, designers, technologists and sales commissions for referrals with PressCoin earned from the sale of advertising and subscriptions. Crowd-funding will also be able to be carried out using PressCoin for finance, and if the PressCoin marketplace achieves sufficient liquidity the value of PressCoin could start to rise independently of the value of the underlying business that it sits on. This aspect of the Initial Coin Offering method of funding a networked platform business is a fascinating aspect to the economics of crypto currencies and I plan to discuss this in part two of this report. This was the part of PressCoin’s vision that initially had me excited, albeit for somewhat self-interested reasons, in relation to Scoop.co.nz. As readers of Scoop.co.nz will know, we have developed a novel way to fund our public interest news services - our Ethical Paywall and our raw news publication model. These are approaches to news revenue generation that we are very keen to accelerate and see used for funding more quality public interest journalism. A couple of months ago the Scoop team even began internal discussions around planning a crowd-equity raising - a project we called Scoop 3.0 - to provide us with funds to develop a new cloud based SaaS version of Scoop, one which could be deployed by small groups of entrepreneurial reporters and technologists in other jurisdictions. PressCoin’s support and the Quintype technology suite - if it works as advertised - would enable us to massively accelerate this path. it was therefore very exciting to see the support of projects like this in their roadmap. Scoop’s "Ethical Paywall" is so-named - using Fair/Ethical trade parlance - because it addresses the market failures for two groups in the news supply chain : a) journalists and publishers who can’t get paid; and b) readers who are increasingly finding themselves on the wrong-side of paywalls which prevent them from reading articles they need to access to fulfil their obligations as informed voters. "help create a polis trained to participate generatively in the public sphere"
After our initial conversation I followed up to Amit with a written description of Scoop.co.nz’s "Ethical Paywall" and raw news publishing approach to news monetisation. 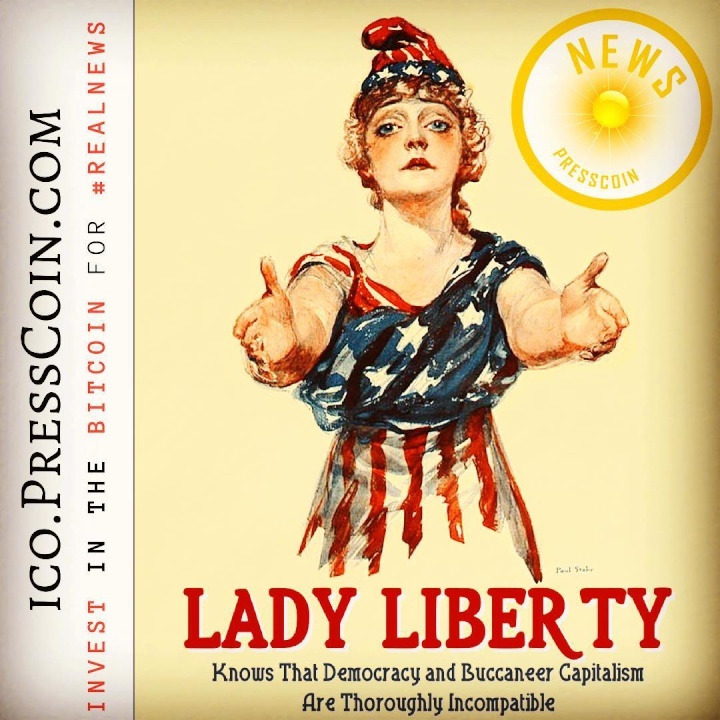 I pitched the idea as a good fit for PressCoin’s objectives – a business model which is neither advertising nor member funded, and one which is by its very nature decentralised and which results in an open website that can serve the public interest. In May 2015, responding to a precipitous collapse in advertising revenue yields after NZ’s 2014 General Election Scoop.co.nz introduced a novel news monetisation model which we originally called an "invisible paywall". Invisible because we don’t actually have a paywall at all – and a paywall because we require professional users of Scoop to pay to access the site. the ability to reach, through Scoop, a high quality audience of decision-makers with their news releases. Our funding model incentivises us to produce content which is useful for our paying institutional and organisation readers – and this content is by default also useful for society as a whole, and is unlikely to be very click-bait like. When we introduced the idea we thought we had a pretty marginal chance of success – I put our odds of succeeding at around 10% at the beginning of 2015. But thanks to the amazing support of our readers, who donated more than $150,000 in crowd-funding campaigns to enable us to make the transition over a two year period, by May 2017 we had grown our licensed professional user base to 180 organisations and were within sight of reaching our goal, advertising-free sustainability. Amit sent off our proposal to his collaborators for their consideration and invited me to assist with the effort to put PressCoin together. At which point I began to meet the PressCoin team.After a week of working with them I confess that I am growing rather fond of their way of doing business. First of all Amit Rathore, the driving force behind the PressCoin project. A technologist first and foremost – and a remarkably adept one on the basis of what I have seen – Amit is also a very open, down to earth, accessible and kind person. He seems to be very genuinely concerned for the future of the planet and of its people just as I am. 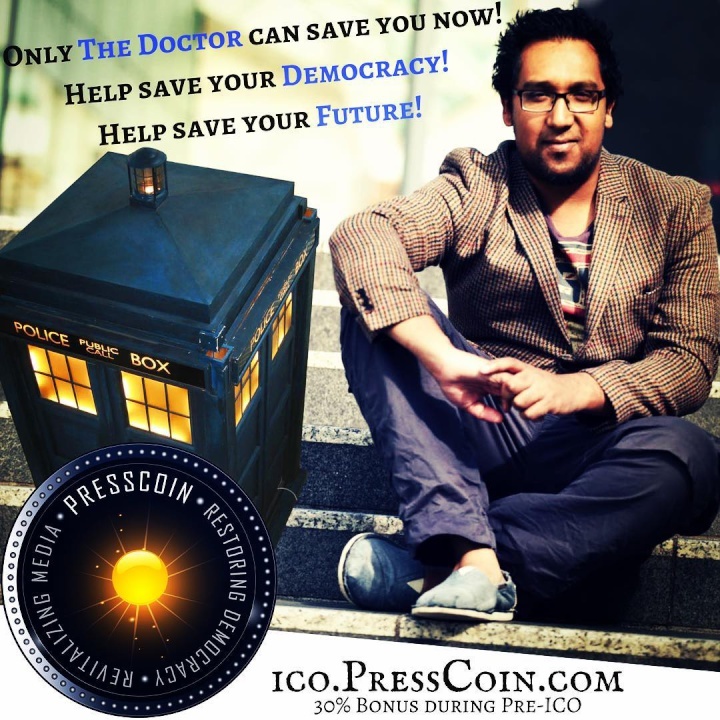 Based in San Mateo California Amit coordinates the work of the PressCoin ICO team, which at this point numbers about 20, and is and based in at least four countries, India, the UK, the UK and France (me). Early on in my engagement with Amit I pushed him a little to help him prepare for what it will be like if an investigative journalist decides to have a go at him about the ICO funding model. Amit responded very naturally and confidently, albeit a little tersely. My impression at this point is that he comes more from the Tim O’Reilly/Craig Newmark mould of entrepreneurs, as opposed to the Mark Zuckerberg/Steve Jobs one. My introduction to Amit’s team came shortly after we spoke, and initially via the online collaboration tool Slack. To get to know their community PressCoin had simply set up an open slack instance and invited all-comers to talk to them directly. A very open start-up approach. Inside Slack I soon met Amit’s cousin Manshu Rathore, an ex-Quintype engineer, who is based in India, very helpful, and as far as I can tell doesn’t sleep. Next I met Andreas Stenzel, who lives near Amit and whose kids play together, Andreas is managing the paid marketing side of the launch using an impressive array of spreadsheets - another very down to earth, open and competent, experienced technology industry person. I next met two more of the founders – Andrew Markell and Gunther Sonnenfeld, who are also partners of Amit’s in another related venture, HigherOrderVC, a VC company which is focussing on Blockchain technologies for "Enlightened Value Creation". Andrew and Gunther are busy working behind the scenes to line up high net-worth investors in the PressCoin ICO. 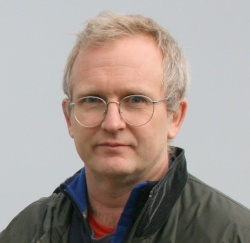 For some considerable time Gunther has been working closely with Journalist Dr Nafeez Ahmed, whose INSURGE Intelligence investigative journalism platform is the initial flagship platform for the PressCoin crypto-economy. A beta version of the platform is online and a working version is expected to be launched early in the new year. Nafeez is an experienced investigative journalist whose work Scoop had the privilege of publishing as early as 2002. Over a skype call from the Geneva waterfront I talked with Andrew and Gunther for some time about the amazing rise in the price of Bitcoin. I was quickly brought up to speed with various theories on the remarkable events of the past few months in the cryptocurrency world. Finally I have conversed via IRC with, albeit not yet met by voice or video conference, another of PressCoin’s founders Amit Bansal, a web-wizard and entrepreneur and who is the CEO of PressCoin’s NextElection platform, a new digital townhall which plans to bring the best aspects of digital communications to bear during (and after) elections everywhere, to ensure voters are fully informed about what and for whom they are voting. More importantly, NextElection will maintain a real-time collaborative spotlight on the incumbents, relevant issues, and challengers - 24/7 - to ensure elected officials are doing their job, and their ratings are transparent. After all, as Amit likes to say, "citizens should be like politicians, remembering at all times, that there’s always a next election coming up …"
And it’s worth mentioning that one of the team members I haven’t yet met is a leading fintech player and who is the genius behind Cointype and CointypeX. So all in all a pretty impressive team. But right now the pressure is coming on the PressCoin team, fast and hard. The next 28 days will be a baptism of fire. To get to USD$100 million will be a remarkable feat, and this team has its work cut out for it. If successful this will be unquestionably the largest initial public fund-raise of any new-media venture ever. The ICO proper opened today. India was the first jurisdiction where investors are able invest directly using fiat currency – and the fiat investment gateway is now open. This allows. investors to purchase NEWS tokens directly in Indian Rupees (INR) without having to first create a crypto wallet and buy some other cryptocurrency. A fiat currency gateway for investors in US Dollars (USD) has now also been opened up. In coming days pounds (GBP), Swiss Francs (CHF) and Euros (EUR) will also be able to be used to purchase NEWS tokens. In some jurisdictions in order to invest with regular fiat currencies, investors will need to prove that they are qualified investors in order to satisfy security laws. Which highlights one of the most fascinating aspects of the ICO boom. At its heart the PressCoin ICO is effectively an unregulated IPO, financed by the sale of a brand new currency. If it succeeds then in all likelihood investors will soon be able to purchase coffee directly from their phones with fractions of their investment – something which is hard to do with shares in Facebook or Appal and also with most other ICO tokens - most of which are not presently listed on crypto-exchanges. The stated intention of PressCoin PLC. is to eventually seek a sharemarket listing for PressCoin, probably in the UK, with each NEWS Token mapping to a share in the new company on the London Stock Exchange. So will PressCoin succeed in this crowd-sale? Obviously time will tell. The ICO closes on January 8th, and if everything goes to plan PressCoin’s NEWS tokens will then be immediately tradeable on the CointypeX exchange. While I have no idea whether it will succeed, I would certainly like it to do so, and not only because it may benefit Scoop.co.nz. If there hadn’t been a bunch of recent ICOs for similar amount of money with significantly less substance behind them than this one I’d have thought this a true moon-shot. But as it is I think this one has a chance – and with the Crypto Currency Boom exploding in the headlines PressCoin’s timing appears to be perfect. And for the reasons discussed in this article, right now, I think the PressCoin plan I have seen so far to save the news industry. 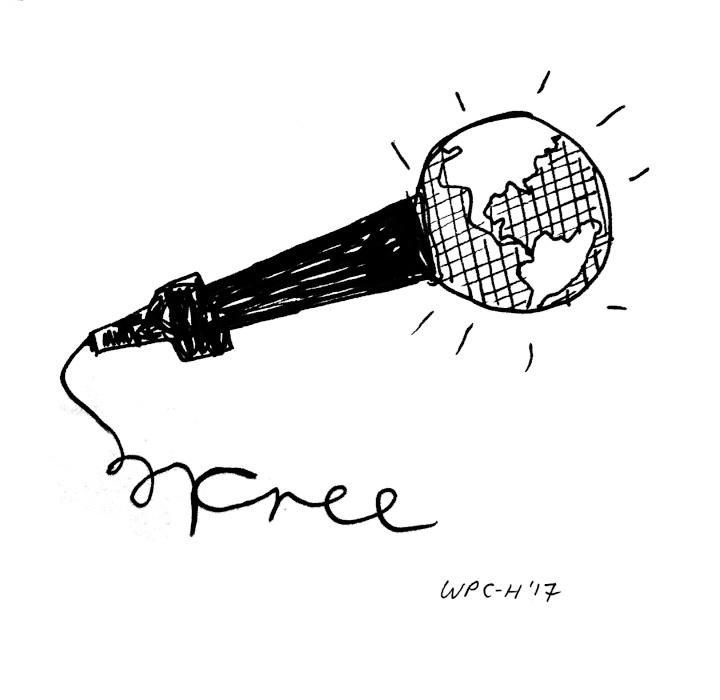 And potentially our planet from the scourge of misinformation. And for all these reasons I am greatly honoured to have been invited to join the team.